Tickets now on sale through April 11! Due to popular demand, GIRLS IN TROUBLE has extended to add additional performances. Don’t miss the most controversial new play of the season. GIRLS IN TROUBLE is a striking and ferocious play which dares to explore the controversial history of abortion, through its life-changing affect on women across several generations. This darkly humorous, shocking new work is sure to inspire spirited debate! 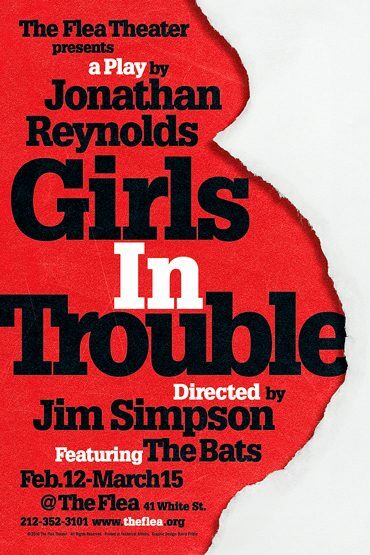 GIRLS IN TROUBLE features 7 actors from The Bats, the resident acting company of The Flea: Andy Gershenzon, Brett Aresco, Betsy Lippitt, Akyiaa Wilson, Eboni Booth, Laurel Holland and Marshall York. The design team includes John McDermott (sets), Zack Tinkelman (lights), Amanda Bujak (costumes) and Jeremy Wilson (sound). Jonathan Reynolds has had 9 plays produced in New York: Stonewall Jackson’s House (short listed for Pulitzer Prize); Dinner With Demons, a solo show in which he prepared a full five-course meal onstage eight times a week; Geniuses, produced by Playwrights Horizons and which ran for a year off-Broadway; the one-acts Yanks 3 Detroit O Top of the 7th and Rubbers at The American Place; Fighting International Fat; and Tunnel Fever or The Sheep is Out. He has had five screenplays produced, most notably Micki and Maude and My Stepmother is an Alien. He is the recipient of Rockefeller and Guggenheim Foundation grants as well as The Dramatists Guild Flora Roberts Award for Sustained Achievement. For five years, he was Treasurer of The Dramatists Guild, and for six years wrote a bi-weekly food column for The New York Times Sunday Magazine. His memoir, “Wrestling With Gravy: A Life, With Food”, was recently published by Random House. For more info, visit Jonathan Reynolds’ website. GIRLS IN TROUBLE runs February 12 – April 11. Schedule varies. The show runs 2 hours with one 10 minute intermission. Tickets are $20 and may be purchased by clicking the red TIX link above. Tickets may also be reserved by phone at 212-352-3101. This production is made possible, in part, with support from the Dramatists Guild Fund.